Every year I SCRAMBLE to get ready for Christmas. Before I know it, I’m passing out on the couch because I’m on my fourth left over Thanksgiving meal and worrying about all the things that need to happen before the holidays. Yesterday, I had a family party to go to with the kids and they were all dressed up and ready to rock and roll. Bill was still getting dressed and I thought to myself… throw Liam in a red vest, get Natalie in whatever dress she owns and snap this puppy already! That’s exactly what I did AND I AM SO HAPPY IT’S OVER!!!! I took a few shots and had the whole thing done with in less than 2 minutes. This picture isn’t the one I ended up using, but I love it and wanted to share. 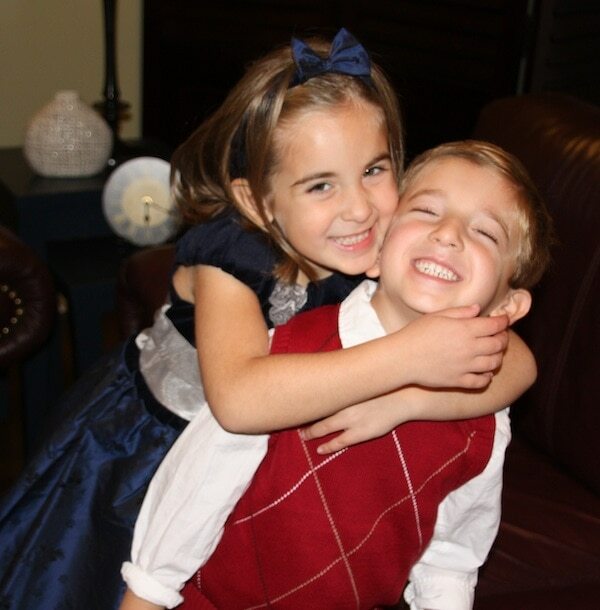 My kids really do love one another. It’s such a blessing to watch. A few minutes ago, I ordered my printed cards and am now sitting back and waiting for them to come. Yes, I just might be that friend who has her card in your mailbox on Black Friday. Don’t you hate those people….. LOL!!! When do you get your holiday cards in order? It gets sooo much easier when your kids get older – they don’t change or grow that much, so you can take your photo months ahead of time. In a few years, you can snap pics on summer vacation for the card photo! miss u all cant wait till sunday! !